These images are in both black and white and color. They are 300 dpi Vector images in PNG format, perfect for commercial or personal use. This set includes tools for the hearing impaired. 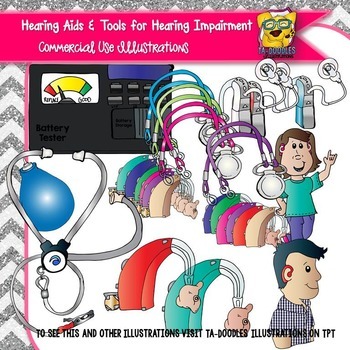 A boy wearing a hearing aid, girl with hearing aids signing "I love you", hearing aids with the battery exposed, hearing aids in multiple colors, cochlear implant in multiple colors. There are a total of 37 images in this set.